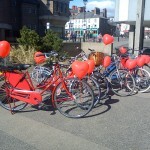 Darlovelo is a city bicycle sharing scheme for Darlington. We have a range of stylish adult bikes, including Dutch bikes, hybrids and folders, available for hire in Darlington for a small charge. To take advantage of the scheme, you need to join Darlovelo. Members then pay a small deposit. The scheme is designed to encourage users to use a bike as an everyday form of transport. This scheme is unique as once you hire the bike from us you keep it with you for between one week and a whole year. It is not ‘pay per ride’. By keeping it, it is more convenient as you can go straight from your home to where ever you please. If you are interested in joining Darlovelo, and would like to try one of our bikes, email us at cool@darlovelo.org or telephone 07519 741734.